The World Open has found a home in Philadelphia for more than 25 years. The 41st edition took place in its new home of Arlington, Virginia. The tournament attracted more than 1200 players and it seems as if players were satisfied with the new venue. Every year there is usually a strong Indian contingent, but it appears that they decided to play in the Commonwealth Open in South Africa. 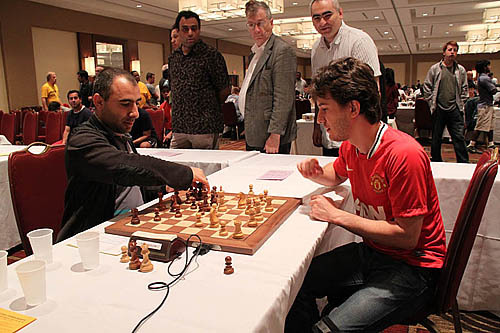 However, the biggest surprise may have been the presence of Cuban Grandmasters Lazaro Bruzon and Quesada Yuniesky. Both were vying for the championship until the very last round. 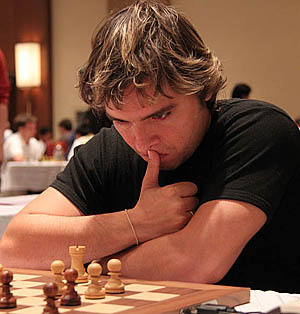 Varuzhan Akobian drew with Sergey Erenburg in round six ending the tournament with four draws and a 10-way tie for first. At the end, Varuzhan Akobian sat atop an incredible 10-way tie along with the following players: GM Lazaro Bruzon (Cuba), GM Viktor Laznicka (Czech Republic), GM Tamaz Gelashvili (Republic of Georgia), GM Quesada Yuniesky (Cuba), GM Sergey Erenburg (Pennsylvania, USA), GM Parimarjan Negi (India), GM Alejandro Ramirez (Texas, USA) and GM Yury Shulman (Illinois, USA). IM norms were scored by Sean Vibbert, Luke Harmon-Vellotti, Arthur Shen, Kevin Wang and Christopher Gu.